FiveStars is excited to announce our partnership with the city of Palo Alto, CA to bring the area its first unified “Made in Downtown Palo Alto” campaign! 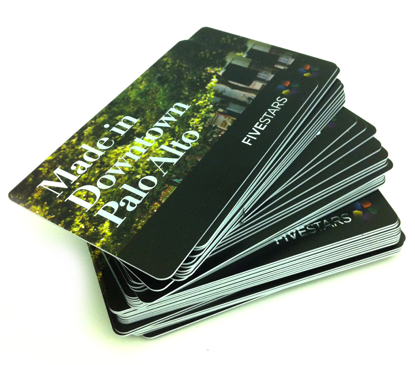 The “Made In Downtown Palo Alto” card, powered by FiveStars, will be the official VIP loyalty card accepted at businesses in Downtown Palo Alto, and is the broadest sweeping marketing campaign launched by the Palo Alto Downtown Association to date. The “Made in Downtown Palo Alto” campaign involves everything from highlighting all participating merchants on maps at CalTrain stops and hotels, promoting members to tens of thousands of consumers at city events like the Film Festival, and distributing cards to all 20,000 residents that live or work around downtown. This campaign also features a walking map, highlighting the participating businesses, which will be distributed in the Made In Downtown Palo Alto Magazine, local hotels, and Cal-Train stations. For those of you who already have a FiveStars card, don’t worry, your regular card (and phone number) will still be accepted at all of these locations. However, if you want to pick up one of our awesome “Made In Downtown Palo Alto” cards, just make sure to activate it with the same phone number. This entry was posted in Features, General News, Get to Know FiveStars and tagged Buy Local, Downtown Palo Alto, FiveStars Card, FiveStars Loyalty, Palo Alto. Bookmark the permalink.